Hello! It's time for another CR84FN Challenge! Thank you to all who joined us last week.. it was fun viewing all of your fabulous creations! 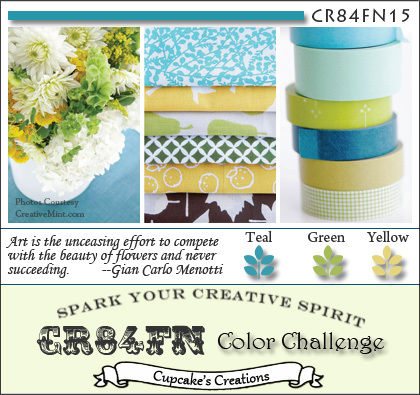 For this week's challenge (CR84FN15), our color palette is Teal, Green and Yellow. The photos in the graphic above are courtesy of Leslie at A Creative Mint. I quickly went through my stash and couldn't find any patterned papers that I liked well enough to use, so I made my own background paper by randomly stamping some doilies using My Mind's Eye Gertie "Girly" stamps. I was fortunate enough to win a collection of my choice from MME, and I chose the Stella & Rose - Gertie collection.. LOVE it! I didn't want to cover up the doilies, so I only added a strip of green vellum. I created my tags using Papertrey Ink stamps and die from Fillable Frames #1. I used my Copic Y17 marker to color some seam binding ribbon. Accessories: Fillable Frames #1 die (Papertrey Ink), Seam binding ribbon, Y17 marker (Copic), Crystal stick pin (Pizzazz Aplenty), Rose (Prima), Twine (May Arts), Foam tape, Thread, Sewing machine. 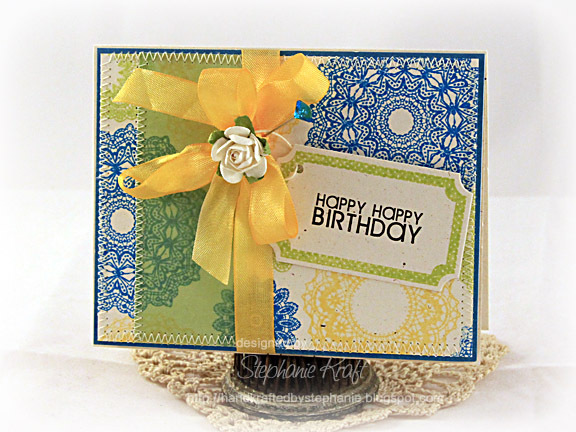 The Vellum overlay looks wonderful over the BG paper you created with the Doily! Fab BD card! Those doilys look fab, and the layout is lovely. The doilies are super - must check them out ;) I really like the stitching and the soft green vellum is lovely as it enhances the patterned background. Wonderful! Love your doily background and the strip of vellum was very inspired. Beautiful design! Oh WOW!! This is beautiful!! oh girl, this is fabulous, love the colors...wow! Oh I LOVE the doily background! Just brilliant!!! And the vellum is such a lovely touch! Love the seam binding and the rose emellie!!! GORGEOUS work GF!!!! Lovely in every way...great BG, beautiful colors and nice layout design! Stephanie, LOVE how you added that green vellum! Mona should highlight YOUR card since she's giving those stamps away this week! LOVE that FAB bow with the rose and your stamping is DIVINE! It really is an amazing take on this weeks'colors; gorgeous! Beautiful card, love those papers and these colors are awesome! What a beautiful background you stamped and the colored ribbon is soooo pretty. Such a gorgeous card! Stephanie, I'm a fan of homemade designer paper, and yours is so beautiful. I had to read what stamp set that was, 'cause it is so pretty! Pretty card. The rose detail on the ribbon is very elegant.